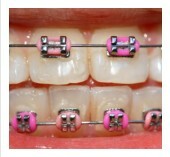 If braces are causing extreme pain or if something breaks, you should call our office. Are you in need of an emergency appointment? We will schedule one for you. Be sure to reference the list below for some immediate solutions. Using the tip of a pencil eraser, push the poking wire down or place wax on it to alleviate the irritation. If your bracket or band is still attached to the wire, you should leave it in place and put wax on it. If a wire is loose, try using tweeters to put it back into place. If this does not help, place some wax over it. When you get your braces on, you may feel general soreness in your mouth and teeth may be tender to biting pressures for three to five days following the adjustment. This can be relieved by rinsing your mouth with warm salt water. Another option is to use Orabase as a temporary covering to the affected area. If the tenderness is severe, take aspirin or whatever you normally take for headache or similar pain. The lips, cheeks, and tongue may also become irritated during the adjustment process. They toughen as you get used to the feeling of braces. Put wax on the braces to ease the pain associated with this process.